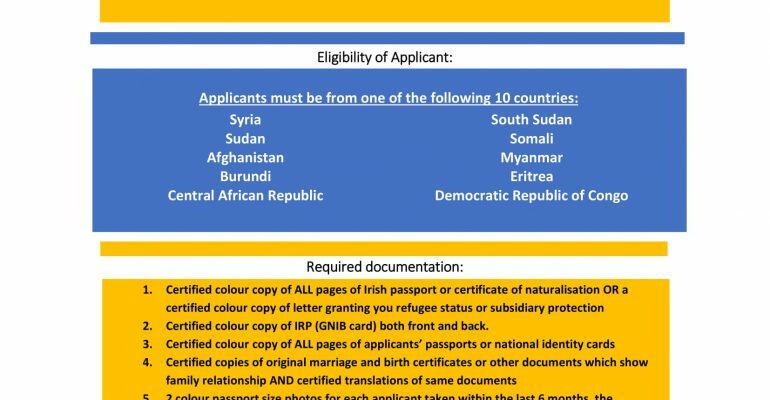 The proposal form for the second round of the Irish Refugee Protection Programme Humanitarian Admission Programme was made public on Thursday, December 20. The full form can be found on the INIS website. Proposals should be submitted no later than 8 February, 2019. Certified colour copy of ALL pages of Irish passport or certificate of naturalisation OR a certified colour copy of letter granting you refugee status or subsidiary protection. Certified colour copy of IRP (GNIB card) both front and back. Certified colour copy of ALL pages of applicants’ passports or national identity cards. 2 colour passport size photos for each applicant taken within the last 6 months, the names of each applicant written on the back in block capitals. Certified copy of evidence of legal guardianship if applying for minor child who is not a biological child. Letter from landlord or council if renting home which states the number of people who may live in the property if applicable. Copy of tenancy agreement if applicable. If own your own home evidence of mortgage and if home is owned and paid off evidence of this if applicable. If arranging housing in separate home, a letter from the property owner confirming applicants may live there for at least 12 months.